Despite its in-the-moment nature, having a defined Instagram strategy is imperative for brands. In fact, research shows that 65% of the top performing posts feature products, and 7 out of 10 hashtags included in captions are branded. Monitoring some of the most inspirational brands on Instagram will likely reveal that strategic product promotion and hashtag usage results in better audience engagement and growth. To enable brands to understand their competitors’ Instagram strategy at the profile level, we’ve released the new Instagram Competitors Report—available in Corporate plans and above. Similar to the Facebook Competitors Report, you can use this report to track fundamental metrics for any public Instagram profile. Easily compare and benchmark these metrics against competitors or within a portfolio of related brands to gain key insights into how your brand stacks up against others in the industry, as well as keep a pulse on what’s happening. 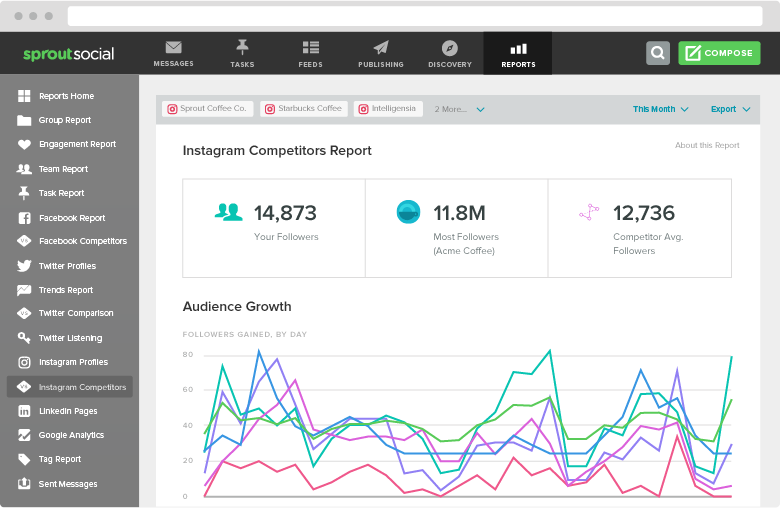 Whether you’re a seasoned Instagram pro or starting a new account, the competitor report provides insights that enable you to inform your social strategy. 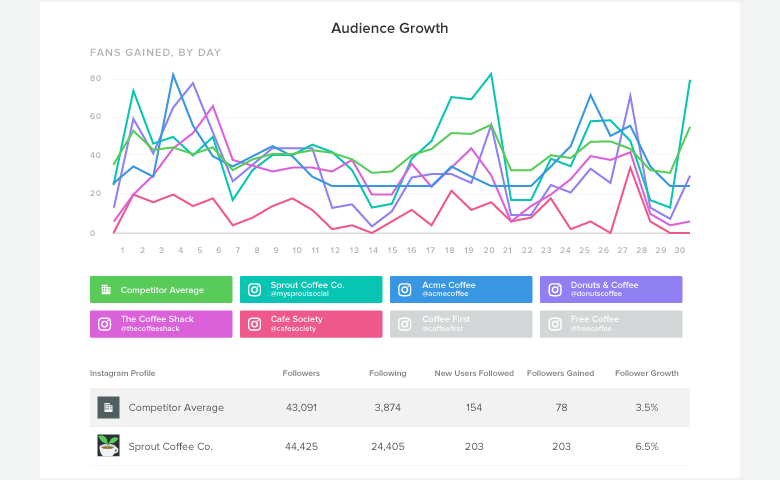 Use the Audience Growth section to pinpoint peaks in new followers, and pair with the Sent Messages Report to understand what posts drove that growth. Use these insights as you build your upcoming content. The Most Used Hashtags section helps you understand what new products or social campaigns your competitors are promoting. These insights will help you stay informed of what’s happening in your industry and with your competitors. 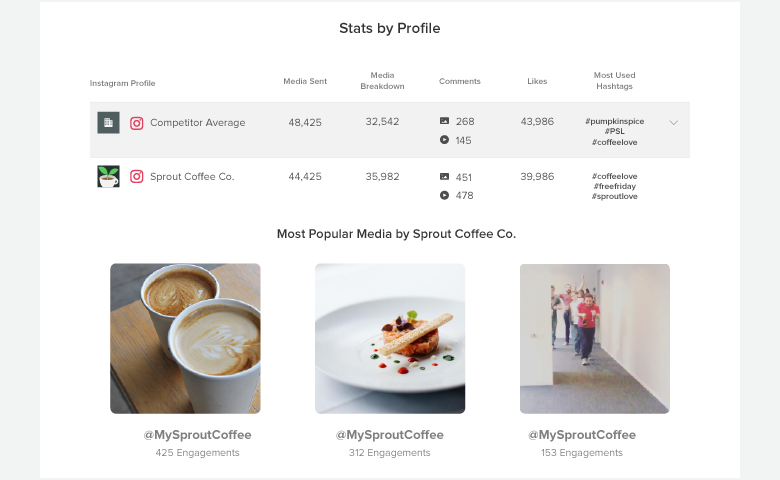 The Instagram Competitor Report is another addition to Sprout’s analytics suite. Share competitive insights—as well as your brand’s Instagram Profiles Report—with stakeholders by emailing PDFs reports from Sprout. By doing so, you can demonstrate your brand’s success or secure buy-in for future campaigns.